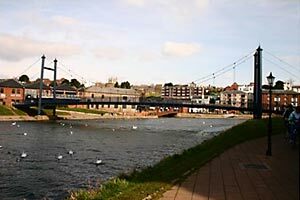 This footbridge across the River Exe was built in 1988 to link the quayside with Haven Banks. Since the 1970's, attempts had been made to open up the riverside for tourism and the establishment of the Maritime Museum on the quay and the development of Piazza Terracina at the canal basin helped preserve the Butts Ferry as a way to link the two sides of the river. Cricklepit Bridge was designed to give an alternative route across the river that was available 24 hours per day. The bridge was designed by Dave Hubbard, the Engineering & Construction Manager for the City Council. Mayor Michael O'Callaghan opened the bridge on 29th June, 1988. Pupils from Montgomery School paraded over the crossing wearing historical costumes from the times when previous bridges were built across the Exe. The structure is built on reinforced concrete piles, while the deck is made of reinforced concrete, cast in glass fibre formwork. The balustrade is of cast iron. The superstructure is of high tensile steel with high tensile steel cables. The bridge was carefully lined up with the central court yard of the new flats to give a view through to Piazza Terracina. It was built for the Exeter Canal & Quay Trust by Christiani & Nelsen of Plymouth and fabricated by M D Fabrications of Newport, South Wales.